Happy Friday! It's a rainy day where I live, but the weekend is shaping up to be nice and sunny! I hope you all have a great weekend. Here’s a quick and easy potato salad recipe that’s perfect to make for your next barbeque, potluck, or picnic. It takes less than 30 minutes to make and it’s lovely to make ahead of time too. 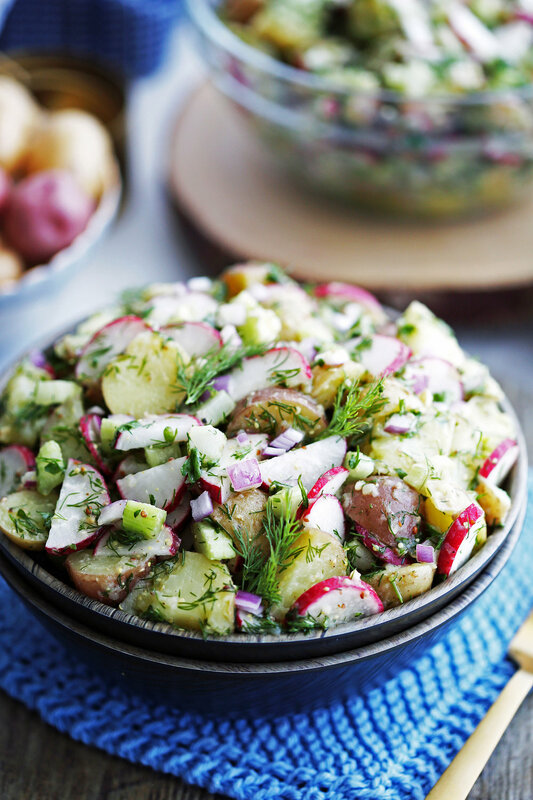 I hope you enjoy this recipe for Mustard Dill Potato Salad! What’s in this potato salad? They are mild in flavour and creamy in texture. They hold their shape better than russet (baking) potatoes when boiled. Russets tend to fall apart when boiled. You don’t need to peel these potatoes. The skin is thin, soft, and easy to eat. Yay for saving time and effort. Plus, leaving the skin on gives the potato salad additional colour. TIP: Remember to quarter (or slice) your potatoes prior to boiling. They will get to folk-tender a lot faster than sticking a whole potato in boiling water. 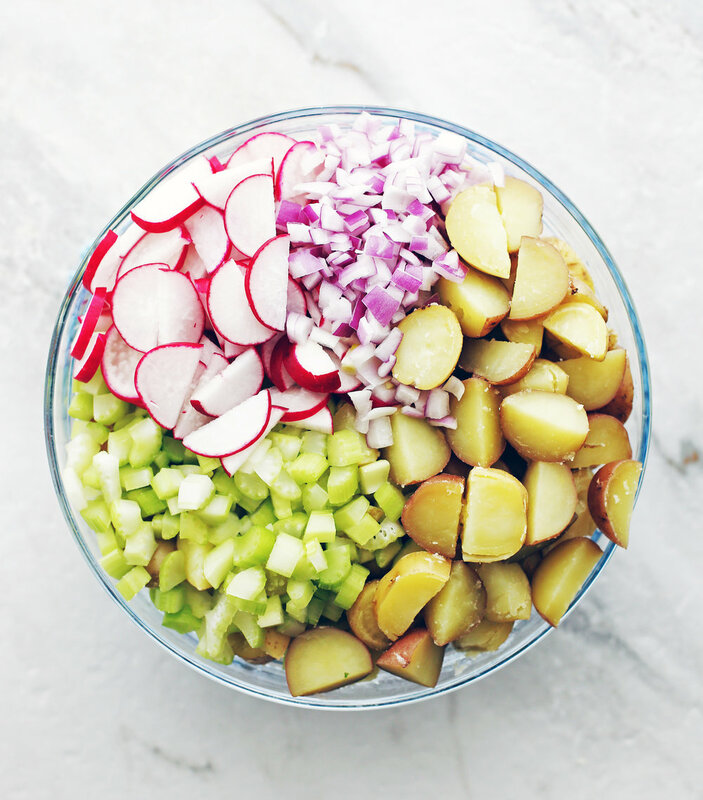 In addition to the potatoes, I’ve included fresh, spicy, crunchy, sliced red radishes, sweet diced celery, and finely diced red onions, which has that pleasant slightly astringent bite. If you don’t like the bite, substitute with green onions. It’s so colourful and full of different textures ranging from creamy to crunchy that comes from purposely chopping up the vegetables into different sizes. This is a mayonnaise-free potato salad that uses a flavourful red wine vinegar-based dressing instead. It’s totally delicious and a lot less calories and fat than using mayo too! If you prefer a creamier potato salad, check out my recipe for Dill Pickle Greek Yogurt Potato Salad. 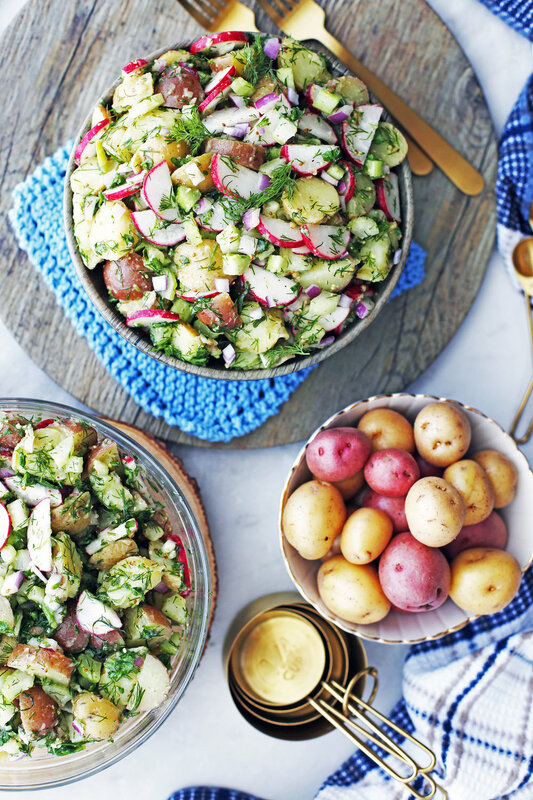 If you’re a fan of dill pickles, you’ll love this potato salad. Place the vinaigrette ingredients in a mason jar, seal it with the lid, and shake the jar to combine all ingredients together quickly. You can also simply whisk the ingredients together in a bowl. 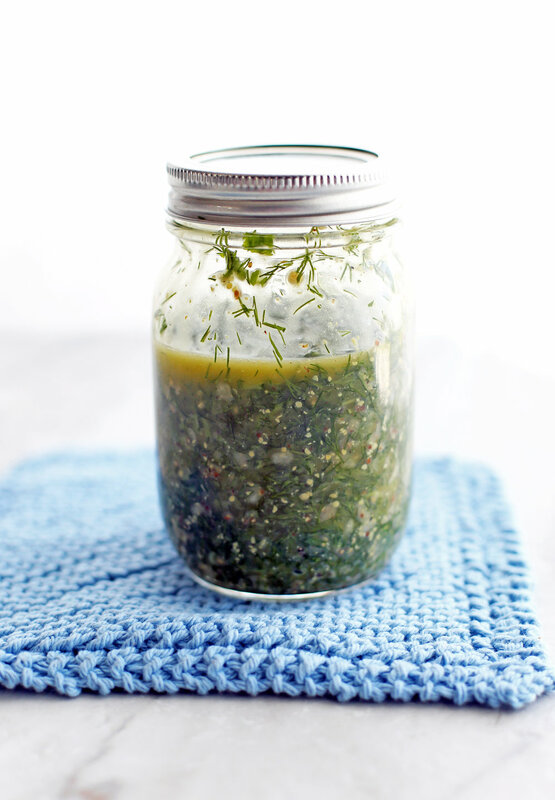 This simple-to-make vinaigrette is heavy in fresh herbs, in particular, dill and parsley. Dill (aka dill weed) has many thread-like leaves and a distinctive flavour that’s aromatic, warm, slightly bitter, and has earthy notes similar to anise and caraway. Parsley (curly or flat-leaf) has subtle sweet, earthy, slightly astringent notes. It’s used to enhance the flavour of herbs and spices. Did you know that parsley is used as a digestive aid and breath freshener? It’s also is a good source of vitamin A, vitamin C, and iron. Then there is the savory kick of Dijon mustard, red wine vinegar, and fresh garlic cloves. Dijon mustard has a bold mustard-y bite, is pungent, and has varying levels of heat and acidity depending the type of vinegar or verjus (pressed juice of unripened grapes) and mustard seeds used (mild yellow to hotter black seeds), as well as the age of the mustard. TIP: Dijon mustard has different flavours (e.g. some are spicier and/or acidic that others) from brand to brand so be aware of how mustard-y you like your potato salad. It’s easier to start with a little when making the vinaigrette and then increase it after you taste test. Red wine vinegar is made from the natural fermentation of red wine and adds a nice tart and tangy flavour while fresh garlic gives adds its own type of distinct bold, spicy flavour. Combining these strong flavours together with fruity, slightly bitter, smooth extra virgin olive oil perfectly complements those ingredients and the final addition of salt and pepper is key. These ingredients enhance the sweet, tangy, and spicy flavours in this side dish making this potato salad so scrumptious! Vegetarian too. Vegan if you make sure that the Dijon mustard and red wine vinegar is free of animal byproducts too. Boil potatoes in salted water until the potatoes are fork-tender, about 10-15 minutes. Drain and place the potatoes in a large serving bowl. Top with celery, radishes, and red onions. Set aside. Place the dressing ingredients in a mason jar, seal with the lid, and shake the jar until the ingredients are well-combined. Alternatively, you can whisk together the ingredients in a medium bowl (dressing will be thick). Taste and adjust to flavour preferences. Pour the dressing over the potato salad. Gently toss to combine, making sure the potatoes are evenly coated with the dressing. Season with additional salt and pepper to taste. Serve immediately or cover and refrigerate until ready to serve (up to 3 days). Best served at room temperature. Different brands of Dijon mustard has different flavours (e.g. some are spicier and/or acidic that others) so be aware of how mustard-y you like your potato salad. It’s easier to start with a little when making the vinaigrette and then increase it after you taste test it.